Here is a handy, low tech gadget that will take up no room at all in your gadget bag or even your wallet. We take a look at what it does. 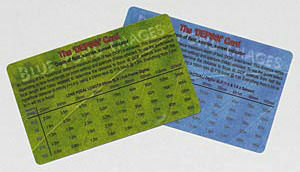 DEPSSI stands for DEPth of field and Sunrise Sunset Indicator and it does just what it says on the card. 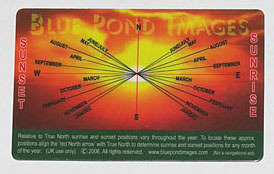 On one side of the card is a red, North/South line which, when lined up with true north, indicate via series of lines pointing out from the centre of the card, the direction that the sun will rise and set for each month of the year. The card is only of any use in the UK, that is, until you turn it over where you will find the depth-of-field guide. With modern lenses often lacking any form of guide, this area of the card can prove invaluable. There are two different versions of the card, green for 35mm and full frame sensors and blue for APS-C cropped sensors (1.5x and 1.6x crop factors) with a table and a short explanation of its use. By focussing on the Hyperfocal distance for any given combination of f-stop and focal length, you can maximise the depth-of-field achieved and this little card has a table of those distances to save any complicated mathematics. You just look up the focal length along the top of the table and the f-stop down the side and the distance given where the column and row intersect is the hyperfocal distance that you need to set the lens to. This will keep everything from half that distance to infinity in focus.